The Haw Creek Community Association is vital to our neighborhood; not only for our social events and newsletter, but letting the city know the feelings of our community regarding issues that affect Haw Creek. At our Annual Meeting on Tuesday, March 6, 2018 we will be voting for six new board members. Per our By-Laws, the membership votes on board members at the annual meeting, then the board votes on officers. Next year the board will be voting for President, Vice President, Secretary and Treasurer. Next year will be a challenging year; the community will be working on Haw Creek Comprehensive Plan to be submitted to the city. This Plan will be the community’s vision for Haw Creek in five, ten, fifteen years. 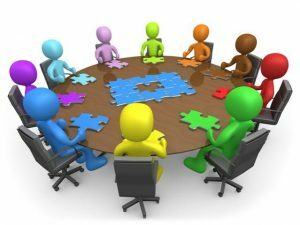 If you are interested in being on the board and contributing to make Haw Creek a great place to live then please email us HERE. The mayor reported about bond referendum scheduled improvements–a sidewalk on New Haw Creek from Beverly to Bell Rds–scheduled for a 2019/2020 time frame. While certainly a needed and welcome improvement, many residents spoke up about the need for a more comprehensive approach to pedestrian and bike safety in the Haw Creek valley. This desire for a more holistic approach to the safety needs of our growing community has evolved into the ‘Move Haw Creek’ campaign. In two follow up meetings since the mayor’s meeting, Haw Creek community members have identified and prioritized four community values they would like incorporated into any proposed improvements. Next, Move Haw Creek volunteers identified five potential improvements that may improve pedestrian and bike safety in the Haw Creek valley. Small groups–including any interested resident–will be evaluating these five ideas for feasibility. As the evaluation of these ideas is just getting underway, any interested Haw Creek resident is welcome to participate. Please email us at Movehawcreek@gmail.com to indicate your interest. After evaluating for feasibility, we are hopeful of having a community discussion in 2018 about which options may or may not work for our community. If you are curious about the proposed sidewalk along New haw Creek Road from Beverly Road to Bell Road, Here is the link to the City of Asheville website that tells you where they are with the project. We can’t get you to the exact link for the snapshot below. You have to follow these steps. You’ve seen it: The moms with strollers, or the joggers, or the kids, or the bike riders, all straddling the edge of New or Old Haw Creek Road. It gives you a shiver knowing how easily things could go deadly wrong. It doesn’t have to be this way. We can make it safer to move about in our community. Haw Creek residents have come together before to improve things and we can do it again. Plan to join us 7pm Monday, October 9th when we welcome Esther Manheimer, Mayor of Asheville, and Anna Henderson, Division Traffic Engineer for the N.C. Dept. of Transportation, to discuss how to make our community safer for walking and biking. The meeting will take place in Evergreen Charter School at 50 Bell Road. 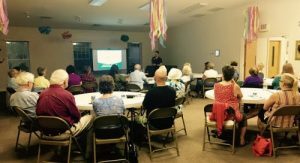 One of our business sponsors, Asheville Digital Lifestyle held a computer learning course in Haw Creek. We had 30 attendees. It was a very successful program. We would love your comments on this course and if you would be interested in more courses like this. You can email us HERE. If you would like to be a business sponsor and put on a program please contact us at info@ilovehawcreek.com. Click on the photo below and you will be redirected to the smokeymountains.com interactive fall foliage prediction map. In all 50 states, bicyclists are accorded the same rights and are expected to obey the same laws as drivers of motor vehicles. Bicyclists fare best when they ride predictably and follow the rules of the road. The following suggestions are offered from a positive desire to help all to “share the road”. 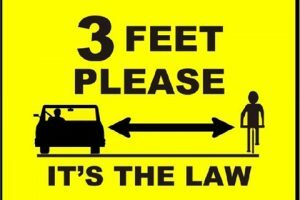 Always leave at least 3 feet between the right side of your vehicle and a bicyclist when passing. Always make sure it is safe ahead before passing a bicyclist. No passing should be attempted on blind curves and near the crest of a hill. Reduce your speed when passing a bicyclist, especially if the roadway is narrow. Be aware that when a road is too narrow for cars and bikes to ride safely side-by-side, it is safest for t he bicyclist to take the travel lane, which means riding in or near the center of the lane. This is allowed in the laws of all 50 states. Do not honk your horn when approaching bicyclists as this can startle them and cause them to loose control of their bicycle. In inclement weather, give bicyclists extra room, as you would other motorists. Always yield to a bicycle when you are turning from or entering a main roadway on which they are traveling. Look for approaching situations and obstacles that may be hazardous to bicyclists, such as potholes, debris, and glass, and then give them adequate space to maneuver. Look for bicyclists before opening your car door on the traffic side when parallel parked. Most bicyclists do not receive training in proper riding behaviors. Some ride inappropriately and cannot decide whether they should ride in the street or on the sidewalk. Children on bicycles often act unpredictably: Expect the unexpected in these cases. Tips on Bicycling Safety. Cyclists fare best when they act as and are treated as drivers of vehicles. Obey the traffic laws – stop at stop signs, obey traffic lights, rideon the right side of the road. Be visible – wear bright colored clothing, use lights at night, rideon the road – 1 to 3 feet to the left of the curb or road edge. Be predictable – use hand signals, attempt to get motor vehicle drivers’ attention when making lane changes or turning. Unfortunately, not everyone who rides a bike understands or obeys the rules of the road. The following are some of the common errors you may encounter as a motorist. Wrong way riding. Bicyclists riding on the left (wrong) side of the road, facing traffic, cause 14 percent of all car/bike crashes. Look both ways before turning to avoid these crashes. Mid-block ride-outs. This is the most frequent crash type for young riders and occurs when the bicyclist enters the roadway from a driveway, alley, or curb without slowing, stopping or looking for traffic. Bicyclist failure to yield when changing lanes (11 percent of car/bike collisions occur when the bicyclist fails to look before changing a lane or dodges a hazard in the roadway without signaling. Bicyclist failure to yield to crossing traffic (9 percent of car/bike collisions occur when the bicyclist fails to stop at a stop sign or traffic light and enters the main road without first stopping and determining it is safe to do so. Some times bicyclist fail to stop because a triggered light will not change for them. They still need to stop and yield before entering the road. National Night Out was a big success. Thank you to Asheville police department, NC State Police, Buncombe County Sheriff Dept. and the two Haw Creek fire stations that attended; thank you Target, who provided the food, LEAF Easel Rider, Evergreen Community Charter School, WellSpring/MindSpring, iHeart Media Asheville and Haw Creek Commons who also provided the grills and the grill masters. We would also like to thank all the Asheville businesses who provided raffle prizes. We would like to thank every one who attended National Night Out this week and stayed with us for the evening despite the rain. See all of you next year – the first Tuesday in August.